Buffers gastric acid in the stomach. THIS PRODUCT IS ONLY AVAILABLE ON OUR WEBSITE. Neigh-Lox is a pelleted supplement designed to maintain normal digestive function in high-performance horses. 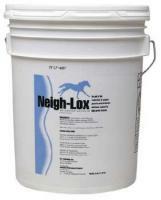 Specifically, Neigh-Lox buffers the stomach from the ill effects of gastric acid. Horses engaged in high-intensity exercise will often have a decreased appetite, which wreaks havoc on an endurance horse's ability to compete. Horses given Neigh-Lox are more likely to stay on their feed and be willing to work. The active ingredients in Neigh-Lox buffer gastric acid as well as protect and preserve the stomach lining from continuous exposure to gastric acid. The acid-neutralising properties of Neigh-Lox are conferred by dihydroxy-aluminium, sodium carbonate and calcium carbonate while aluminium phosphate serves as a gentle coating agent. Available in a 3.5 lb pail and 25 lb bucket.